Color has a direct effect upon the body, so that we respond differently to tangerine and indigo blue. Thiebaud is a supreme colorist who arouses pleasure through the juxtaposition of such warm and cool colors. Using a technique he calls halation (think “halo”), he outlines contours with two or three, usually complementary, colors, creating a deepening resonance and pulsation. The unabashed hedonism of his work is an anomaly among the more adventurous art of the last quarter century. He is firm in his belief that “there is beauty, there is quality — even though we can’t lasso it an put it in a corral.” Rather than a fixed canon, beauty is the object of an endless pursuit, constantly redefined. For Thiebaud, its very elusiveness accounts for all the marvelous variety of artistic expression. The cover painting, Brown River (2002, 72” x 60”), is part of a series of riverscapes drawn from the Delta region of northern California. During the four and half years when the Thiebaud family lived near its banks, the artist’s attempts to capture it in paint fell short of his expectations. Almost by necessity, the subject became a challenge that he had to face. 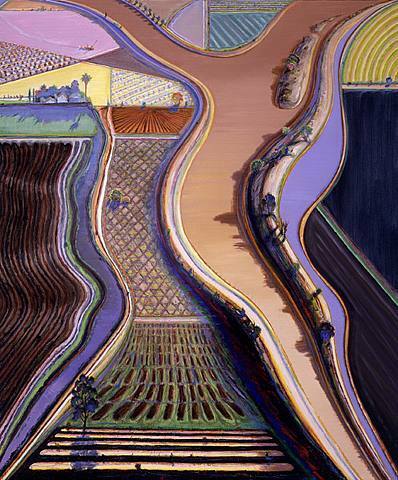 As a boy, Thiebaud spent time on his grandfather’s farm in Orange, County, and for a brief period during the Depression, his family moved to Utah to try farming. His acquaintance with the ritual of farming is first-hand, and he portrays the working of the land as a creative endeavor — a human attempt to harness the raw power of nature. Rather than recede into the distance, the brown river of the title snakes through the composition from the top to the lower right of the canvas, its form echoed by the man-made irrigation system of canals and ditches. Such sinuous lines have long been associated with beauty, particularly in the way they emulate the female form. Posed against a dazzling patterned field, the flesh-colored river has the loveliness of Botticelli’s Venus. Lavender, pink, and yellow are grounded by the reddish-brown jigsaw-puzzle shapes that pinch the midsection, as life bursts forth between fallow fields. A Westerner, Thiebaud recognizes the preciousness of water as a source for vegetation and life. In his canvas, the flow of the river cuts through the regularity of the fields and orchards, seeming to animate with a vital force. The earth’s body reflects our own, as the river seems like a blood vessel nurturing tissue. Inviting us into his riverscape through the bold graphic elements of shape and color, Thiebaud makes us linger in detailed nuances. Scaled to the human body, the canvas has an immediate physical impact. Then our eyes visit the “little world” the artist has created with subtle flicks of his brush. Waiting to be discovered, each element is described by a complex range of color and gesture. Grasping the geography of place from immediate to global, Thiebaud satisfies by providing a full account and a context beyond routine experience. Now eighty-three years old, Thiebaud brings us work equal to the ripeness of his years. Transcending any specific allusion, the delicate balance of the river’s current and man’s cultivation harkens back to the origins of civilization. While striking a note of timelessness, Thiebaud dialogues with the past, adding his response to this ageless theme. Like our collective history or like one man’s life in art, the river courses on.